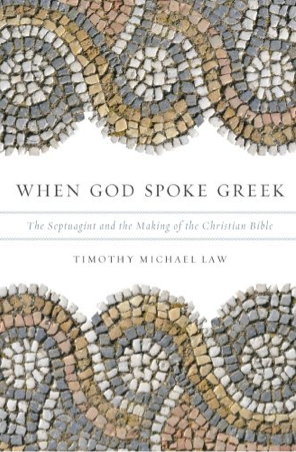 This week I’ve been reading Timothy Michael Law’s When God Spoke Greek: The Septuagint and the Making of the Christian Bible (Oxford Press, 2013). In this work, Law makes reference to numerous text and translation issues relating to various Scriptural passages. In general, he wants to challenge the privileged place of the Hebrew Masoretic text of the Old Testament in the Christian tradition and to argue for the validity of the LXX. The Greek translator makes a theological decision that will later impact Christian interpretation, using “angels” instead of “God” in verse 6 (verse 6 in the Septuagint). The Hebrew Bible, speaking of human beings, reads: “Yet you have made them a little lower than God . . .” The Septuagint translator was perhaps bothered by the suggestion that human beings were only “a little lower” than God, so he changed the passage to read: “You diminished him a little in comparison with the angels” (pp. 55-56). Though the passage was well known to me, I was not fully aware of the text and translation issues within it. The LXX does indeed read angeloi or “angels.” The LXX is also clearly the version cited in the only NT passage—Hebrews 2:7— where the OT passage is directly quoted. What are we to make of this decision? Did the KJV translators here act like many modern OT editors and translators and choose to follow the LXX rather than the Hebrew? Geneva Bible Psalm 8:5: For thou has made him a little lower than God, and crowned him with glory and worship. Hiszen kevéssel tetted õt kisebbé az Istennél, és dicsõséggel és tisztességgel megkoronáztad õt! Note its use of Isten (God) rather than angyalok (angels). The question one might pose is why the KJV translators who are usually so careful to follow the Hebrew original seemingly depart from it here. NASB Psalm 8:5 Yet Thou hast made him a little lower than God, And dost crown him with glory and majesty! NKJV Psalm 8:5 For You have made him a little lower than the angels, And You have crowned him with glory and honor. NIV Psalm 8:5 You made him a little lower than the heavenly beings and crowned him with glory and honor. ESV Psalm 8:5 Yet you have made him a little lower than the heavenly beings and crowned him with glory and honor. The Geneva Bible uses “angels” at Hebrews 2:7 and the Karoli angelok (angels). The modern English translations (NASB; NIV; ESV; NKJV) all use “angels” at Hebrews 2:7 also. The KJV (and the NKJV which follows it) is the only translation that harmonizes the two passages (Psalm 8:5 and Hebrews 2:7) by making the reference identical. Again, this would be a place where one might say that the KJV is driven more by an ecclesiastical concern than a purely academic one. The point is not that the KJV translators were following the Septuagint at Psalm 8:5 but that they were following the Greek of Hebrews 2:7. That is, they were guiding the reader to naturally understand the harmony between Psalm 8:5 and Hebrews 2:7 as part of the harmony of the Christian Scripture. I have been reading this book also. It is a helpful insight since many of the early Christians recieved their Old Testament from the Septuagint until Jerome. I appreciate you pointing out this variant. Most of the New Testament quotations match up with the Septuagint, and I think the KJV translators were privy to that.